Short-scar is a term used to describe this specific type of facelift, where the incision sites are shorter and the scar reduced because of the technique used. MACS, which stands for Minimal Access Cranial Suspension, is ideally suited to younger facial surgery candidates, 30’s to 50’s with mild looseness of their jawline and neck areas. This facelift would likely be done for a patient having their first “facelift”. In later years, a different technique may be needed to address advanced looseness of skin. Younger men and women with mildly loose skin on the neck and a mild degree of facial jowls; Non-smokers with good to excellent health, good skin elasticity and strong bone structure will have the best possibility for a satisfactory surgical outcome. 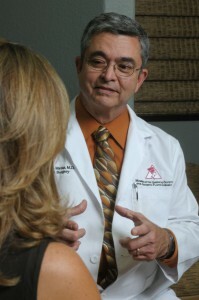 Dr. James Matas, a board certified plastic surgeon in Orlando, Florida, has extensive experience performing facelift surgery, and has been performing the MACS Lift technique for the past 6 years. During consultation, he will discuss your goals and motivations for surgery, assess your physical and emotional health and review information you provide about previous surgeries, past and current medical conditions, nutritional supplements, herbal remedies and pharmaceutical medications you take. He will examine the structures of your face and neck, assessing the quality of your skin tone and bone structure. He will recommend the exact procedure, or procedures, needed to bring about the desired result, outlining the techniques and incisions needed, the type of anesthesia, where the surgery will be performed and the risks and possibility of complications. He may also recommend complementary procedures, such as eyelid lift and others, to enhance the overall surgical outcome. He will advise you to avoid taking aspirin, ibuprofen products, Vitamin E and certain herbal medications before surgery, as these can cause increased bleeding or have undesirable effects with anesthesia. He will also insist that you discontinue smoking for at least one month prior to ensure proper healing. You will also be provided with the financial details, along with a suggested plan of action should you decide to take the next step towards facelift surgery. The procedure begins with liposuction of the neck and chin, where a tiny incision is placed under the chin. Incisions are made in front of the ears extending upwards inside the hairline to the level of the eyebrow. No incisions are made behind the ears. A small area of skin is lifted off the cheek and the underlying SMAS (fibrous layer that sags with aging) is gathered upwards with two to three looped sutures that are firmly attached to strong tissue at the base of the temple. This further tightens the neck, redefines the jawline and elevates the cheek to a more youthful position. The excess skin, which has now been moved upward, is trimmed at the incision line and closed with fine sutures. Surgery is performed outpatient, usually under general anesthesia, and takes 2 to 3 hours or longer if additional procedures are performed at the same time. This is commonly performed with eyelid surgery, brow lift and facial fillers to enhance the overall outcome. You will be discharged wearing a supportive garment over your head and neck. There is mild pain associated with a facelift, but any discomfort can be lessened with prescribed medication. Some bruising, swelling and change in skin sensation will be noticed, and should resolve over the next 2 to 3 weeks. Some mild puckering of the skin may be seen in front of the ears with this procedure, but this resolves on its own in a short time. You will be given guidelines to get plenty of rest, and to avoid strenuous activity, alcohol, steam baths, saunas and sun exposure. After a few days, your neck garment will be removed, and your face may appear puffy and slightly distorted. Treatment with our massage therapist will begin in about 5 days, and this will reduce swelling and inflammation and help you feel more comfortable. You’ll be back to work within 7 to 10 days, but it is suggested that you lessen your professional and personal commitments as much as possible around this time. If you need it, special camouflage makeup can be applied to cover any bruising that remains. Your scars will be minimal, are hidden in your hairline and, with time, they should be scarcely visible. How does the MACS lift differ from a traditional full facelift? The MACS lift, which is also sometimes referred to as a mini-facelift, utilizes smaller incisions than a traditional facelift and is more ideally suited for patients in their 30s, 40s, or 50s who have mild facial skin and tissue laxity, and good skin elasticity. For those men and women with more advanced facial aging, Dr. Matas generally recommends a full facelift and possibly additional complementary procedures for more comprehensive facial rejuvenation. The recovery period after MACS facelift surgery is also about a week shorter than that of a full facelift. Furthermore, the smaller incisions required for the MACS lift (which do not extend behind the ears) result in less post-operative scar tissue. Will the results of the MACS lift last as long as a full facelift? The improvements achieved with the MACS lift typically do not last as long as those achieved with a full facelift; however, each individual face ages at its own rate. Often when patients undergo the MACS lift earlier in the aging process, they opt to follow-up with a full facelift many years later when it becomes advisable. This type of procedure staging allows patients to age gracefully over time and prolong a more youthful look for decades. Can the MACS lift improve the appearance of my jawline and neck? Yes. The MACS lift starts with liposuction under the chin and along the neck, which eliminates unwanted pockets of fat that can cause a puffy appearance. During the procedure, the SMAS tissue and neck muscle (called the platysma) are also lifted and stabilized with sutures to tighten any laxity along the jaw and neck. Patients are usually very pleased with the leaner, more defined jawline and youthful neck profile this procedure can provide. Will my friends and family know I’ve had plastic surgery? The results achieved with the MACS lift performed by Dr. Matas are typically so natural-looking that often friends and family do not know you’ve had surgery unless you tell them. Most people will think your refreshed appearance is the result of a long relaxing vacation, more sleep, less stress, or a new fitness and nutrition regimen. The MACS lift incisions are usually so well hidden that they are undetectable to the untrained eye once they’ve healed completely. Dr. Matas is extremely skilled and experienced in this procedure and is known for his ability to create results that reveal and enhance natural facial beauty. How much does MACS lift cost? Because the MACS procedure is customized to suit the unique needs and goals of each patient, the price can vary. For those interested in getting a general price estimate prior to a consultation with Dr. Matas, we offer a free cost analysis option through our website. Just fill out the information to the best of your ability and click send to deliver the form to our office team. Once received, a team member will contact you with some additional questions and provide you with an approximate quote for the procedures you desire. We also offer financing options through CareCredit® and accept payments made with major credit cards to help make your treatment more affordable. We expect that you’ll be extremely happy with the MACS Lift and the youthful appearance you will regain with having a tighter neck and jawline. Friends, family and associates may comment that you look different, but they may think you’ve been on vacation or have a new hairstyle. Expect many years of satisfaction from this procedure, especially if you care for your investment with professional skin care and lead a healthy lifestyle.